Sorry for the long delay! I really meant to push these out in a series, but my writing's been going really well lately, so I was loathe to leave the writing cave. BUT, I'm back now, so let's talk mon-neh! As the meme dog would suggest, here are some DISCLAIMERS! 1) Everything below is written in the spirit of sharing information, not as iron clad rules. 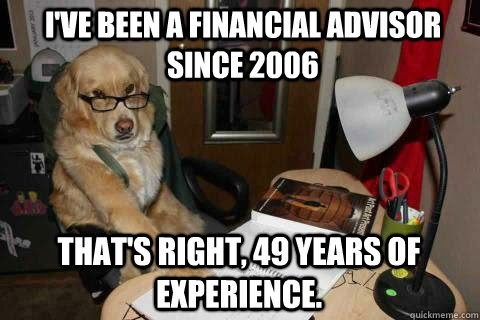 I'm not actually a financial adviser (or a dog), and as such I can only speak from my own experience, which is almost certainly going to be different from yours. With that in mind, PLEASE don't make any major financial, career, or tax decisions based purely off what you read here. 2) All the tax advice below is written from the American perspective, and as such might not be relevant in your country. That said, wherever you live, if you are making any sort of significant income off your creative work and you have a specific tax question, TALK TO AN ACCOUNTANT. Yes, they're expensive, but knowing this stuff is their job, and that's worth paying for. Okay, now that we've established that you're not going to run off and reorder your financial future based off a single blog post, let's get to the good stuff. As we discussed in parts 1 and 2 of this series, it's totally possible to make a living as a writer. I've been doing so off a mix of traditional and self-publishing income since 2008, and am now the sole income earner in my family. How did I get to this point? Planning. Lots and lots of planning. Unlike normal jobs with regular paychecks, writing money comes in like confetti. Most of the time you don't even know how much you're getting paid until the check/deposit comes in. This irregularity can be insanely frustrating if you're trying to support a household, but my husband and I have found that thinking about your budget in terms of the whole year, rather than month to month, makes a huge difference in our ability to weather the feast and famine nature of writing income. For example, say you get a $20,000 advance check. If you're thinking monthly, that feels like SO MUCH MONEY!! If you're thinking yearly, though, it puts that check in the proper perspective, because chances are you're going to have to make that $20,000 last, which leads us to step 2. This is the first step of any financial planning. In order to know how to handle your money, you need to know how much you spend. We're not talking bare bones, "I could live on this if I had to" either. Realistic financial planing requires realistic expectations, so I suggest going to your online banking and taking an average of the last year to see what a normal year looks like for you and your family financially. Also, since we're thinking yearly, not monthly, you're going to want to include large, one time expenditures like car/house repairs and emergencies in your yearly estimates. Disasters might not seem like something you can budget for, but chances are that something is going to happen in a year, and you don't want one emergency to torpedo your entire year, which leads us to step 3. How big an emergency fund will depend on your personal circumstances, but the number one way to keep little emergencies from becoming crushing debts is to set money aside just for covering all of life's unexpected expenses -- medical bills, car repairs, emergency trips to see relatives, and so on. If you're living on the edge already, an emergency fund might feel like a luxury, especially since credit cards can cover just about anything unexpected, but trust me on this. My emergency fund has saved my writing career at least twice now. If I'd put those costs on my credit card, the extra burden of paying it back with interest would have sent me back to my day job. But Rachel, I'm not making a living off my writing yet. Do I still have to do all this stuff? YES. Unless you write a runaway bestseller that makes millions (the writing equivalent of winning the lottery), how well prepared you are financially is the make or break factor in becoming a full time writer. If your dream is to work for yourself and make a living off your stories, then you have to treat your writing like a business, and every successful business has a budget. Even if you're only making a tiny amount off your stories right now, using those dollars to make yourself more financially stable instead of just spending them is making a real investment in your career. It's all part of taking yourself seriously as a writer. All writers, whether you're self-published or being paid by a publisher, are essentially small businesses. Even if your books are bought by a publisher, that publisher is not your employer. They are under no obligation to pay your insurance, your taxes, or your unemployment. Legally, you're an independent contractor selling the rights to a product you created. This is a very important way of thinking for a writer, and not just financially. I know plenty of writers who consider their editor as their boss, but your editor is NOT your boss. They're your client. You are selling them the right to your product, which they are buying to refine and resell. Because of this, it's often in your best interest to try and make your editor happy, but at the end of the day, you are your own boss. You determine your schedule, how many hours you work, and how you use your time. You determine the quality of your end product and what you create next. This self-employed mindset only gets more important when you're self-publishing and you have to take on even more boss-like aspects like budgeting to hire an artist to do your covers or paying for advertising. If all that sounds a little overwhelming, that's because it is. Working for yourself is a marvelous and terrifying freedom, but--unless you're lucky enough to be independently wealthy already or have a spouse who totally supports you--it's a skill you have to master if your dream is to be a full time writer. That said, if you're mature enough to complete a novel, you're mature enough to learn how to be your own boss. It does take some learning, though, especially if you've always worked for others. Probably the hardest transition for me was going from a workplace where I had a boss holding me accountable to working at home. I don't have to tell you how easy it is to piss the hours away when you're home alone, but you can't let that happen. Now more than ever, you have to remember your great dream of being a real, full time writer, and real, full time writers write. They might not write all the time, being your own business also means doing your own business overhead, like emails and so forth, but a successful writer always makes the time to write. One of the biggest pieces of advice new writers get is "be professional" and "treat your writing like a business." Important as this advice is at the beginning, it only gets more critical as writing really does become your profession. So if your dream is to be a full time writer, or if you already are a full time writer and you're struggling like I was, the best advice I can give you is the same advice you heard when you were starting out: be professional. Treat your writing like a business. You wouldn't take a five hour break to play Warcraft in the middle of your office job, don't do it at your writing job. Treat your time like you're still getting paid by the hour, and don't let others take it away. Friends and relatives might think you have a lot of free time since you're working from home, but it's up to you to protect your writing time more viciously than ever. Your dream career depends on it. Save 50% of your writing income for taxes. If you can possibly afford one, hire an accountant. I know it sounds crazy, but "save 50% of your writing income for taxes" is the single best piece of writing advice I've ever received. The reason you have to save so much, even if your tax bracket is low, is because, once again, you are a small business. You don't have a boss withholding your taxes, or paying half of your unemployment/social security. When writing money comes in, that's gross income, which means you're going to have to pay taxes on it. For example, I had one year where I had to write a check to the US government for $14,000. FOURTEEN THOUSAND DOLLARS, in ONE CHECK! If I hadn't known ahead of time to save that money, I'd still be paying that tax bill with interest. This is why you save, because you never know what those taxes will be until you get your forms. Saving 50% is a sure fire way make sure you have enough, and it's not like that money's gone forever. Once April is over and your taxes are paid, any left over money is yours to spend as you like. Until then, though, keeping it off limits will make sure you don't accidentally spend your tax money and screw yourself. So, that's why you save, but why do you need an accountant? Well, as you might have guessed from the above, paying taxes as a person who works for herself is a lot more complicated than filling out a W2. Even if all your money is coming from a single publisher, or just Amazon, it will probably still fall under multiple different sections of the tax code. So, if you don't want to have to learn the tax code inside and out yourself, you are going to need a professional to help you out. Now, obviously, you don't want to hire an accountant if your writing money isn't enough yet to cover their fee. Paying $400 to an accountant to handle $150 worth of writing income is just silly. But if you are making significant writing money, a knowledgeable accountant is worth their weight in gold. As a small business, there are a lot of tax options and deductions available to you that individuals can't claim. Your accountant might advise you to pay quarterly taxes instead of yearly, or they might suggest you form a one person corporation if the corporate tax rate in your state is better than the individual income rate. If all of that made your head swim, congratulations. You now see the value of a good accountant! If you've never had an accountant before, don't be afraid to visit several offices until you find one that you're comfortable with. An accountant is a business asset, don't use one you don't like or trust. You can always switch accountants next year if you don't like him or her, or ditch the accountant all together if you're confident you know what you're doing. But if you're a new author just starting to make real money on your work, it really is worth it to hire a competent professional. Okay, so let's say you've gotten a book deal and you're chomping at the bit to get to get out of your crappy day job and dive into the wild life of the full time writer. How do you know if you can really quit? This is actually a question I get a lot, and one I had to answer for myself. I can't speak to your specific situation, of course, but here are the guideline I used to know when it was time to quit. 1) I knew how much money I spent in a year, and I felt comfortable covering that with my writing money. Remember at the top of this post when we talked about making a budget and emergency funds and all that stuff? Here's where it comes back again. If you want to know when you can quit your job, the simplest answer is to look at your expenses, look at your expecting writing income (less the 50% you're setting aside for taxes), and see if they match. If they don't, and you still REALLY want to quit, this is also the time when you can look at sizing down your lifestyle. Maybe move somewhere cheaper, or cancel a gym membership, whatever it takes to shave your average spending down until your writing income is enough to cover it. That said, though, I would not suggest making a drastic change in your lifestyle. Tempting as the picture of living in genteel poverty for the freedom of being a full time writer might be, we are creatures of habit. If you're used to one lifestyle, trying to suddenly jump down to a much lower one will inevitably cost more than you think because you'll still want the things you had when you were making more money. This is a very personal balance, and I can't tell you where yours will be. The important thing to remember, though, is that you are making a life decision here, which means whatever you choose, you'll be doing it for a long time. Trying to force yourself into a lifestyle you can't live in comfortably for the sake of stretching writing income is setting yourself up for failure. Avoid if at all possible. 2) I made sure my insurance was taken care of. In America, most people get their health insurance through their employers. 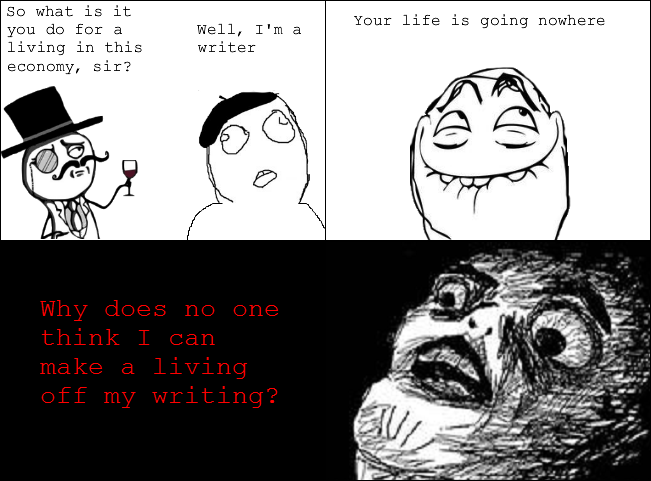 Writers, being self employed, don't have this option. If you are leaving a job that provides your health insurance to write full time, you're going to have to make up that difference. Back when I first quit, this was a huge pain, especially with a child who has special needs. Thankfully, the passage of the Affordable Care Act has made it enormously easier to get affordable individual insurance. I don't care what your politics is, if you're an American writer who has to buy her own insurance, Obamacare was a huge boon for you. Use it well and make sure you've lined up a plan before you quit so you don't have a gap in coverage. 3) I had a back up fund. As I've said many times, writing money is unpredictable. Sometimes you get giant windfalls, other times you go months without a check. Saving during times of plenty to cover the lean years is a vital part of being a full time writer, but what happens if the writing money dries up unexpectedly? What if you have a personal crisis and can't write for five months? What if your publisher suddenly goes under and can't pay your contract, or maybe you put out a new book and it bombs? All of these things are pitfalls that writers will probably have to face at some point in their careers, and the only way we get through them without abandoning our great dreams and going back to the first job that will have us is with a back up fund: a savings account specifically for times of crisis. How much you save will depend on your situation and your risk tolerance. Personally, I saved up six months worth of expenses before I quit my job. This way, I knew that even if disaster struck, I'd have six months to fix it, or, in the absolute worst case scenario, find a new career. I know six months worth of expenses sounds like a lot, and it is. Some people feel comfortable with keeping only two months in savings, others prefer having a year's worth in the bank. The exact amount depends on you, your family, and your needs, but even if your book is selling like gangbusters, you need to have some money in the bank when you turn in your notice. Again, writing money is fickle. It can dry up at a moment's notice, and the only way you get through that drought without declaring failure and crawling back to your job is by thinking ahead and saving. And That's How You Avoid Being a Starving Artist! Thus concludes my series about writers and money. I know I probably sound like the most risk-adverse, boring person on the planet right now, but in money as in writing: preparation will set you free. The more you know and the more prepared you are, the easier, happier, and more likely your transition from hobby writer to full time author will be. Thank you for reading, and I really hope my experiences with writing and money help you live the dream and make the jump to the best career in the world! Working on a yearly budget and having a plan is good financial advice no matter what you do for a living. It also helps to "Keep a small nut" - minimize your mandatory expenses, so you can more easily cut things out if times get tough. I hadn't thought of the cost of health insurance--glad I live in Europe! Another thing you need to save for is your pension, which at least over here is normally taken care of by your employer. I have to admit, the whole "be a business" side of writing is a bit daunting. Not so much the number bit--I'm an engineer, so I feel confident I can get through that part--or even the make-your-book bit. It's all the bureaucratic stuff that scares me--how will I even know what forms I need to fill out? What accountant to get? What kind of company to start? What insurance I need? There are about 0 articles for indie-writers in my country, seeing as e-books haven't really taken off here (I'm writing in English though). To anyone thinking that this advice sounds big, scary, heavy-handed, and overly cautious -- you're right about the first two. This is a big, scary venture! But Rachel is absolutely, positively, 100% right about how to go about this. One of my friends who's very successfully self-employed (not as a writer) gave me the excellent advice that you never want to be making choices out of desperation. It may not sound romantic or fun to save up a huge safety net, or stay formally employed until you're making enough from writing that it replaces your income -- but it beats the hell out of being well and truly broke with no way out. I took the middle road: I moved someplace cheaper, so that I could drop down to part-time hours in the day job. It's going well for me so far -- having some steady income gives me the peace of mind to do good work when I sit down to write. Great advice, Rachel, with important emphasis put in all the right places. Writing, for most, is foremost a calling before it is a business. A calling is something that generally resists practicality and prudence and long-term consideration, but for that calling to be sustainable, it needs to have some scaffolding to avoid the uncertainties and downright realities of life. I know what you mean about sounding dull and overly practical, which is part of the reason it's important to share this kind of information. Writers tend toward the conditioned mentality that you aren't supposed to think about these fundamentals of getting by, but, well, that's a conditioned mentality, and having it prevents a person from really pursuing their calling long-term, which is generally what it takes to get good and to do honor to the original creative impulse. I would like to add that nowhere in your article did you preach about how a person needs to compromise his/her creative vision to chase after money or anything. It's all about having reasonable goals and pouring your love into your craft and situating your life (this includes finances) so that you can continue. Thinking about it as a business is important because it's not like if you don't think of your stuff that way that it doesn't exist in the consumer world as a consumer good (of sorts). Thinking about it as a business positions the writer so that she's being smart and more or less in charge.